You’ve brought your little bundle of fluff through the door. You have ideas of where you are going to start socializing him. His crate is set-up to start toilet training and you’ve got a basket full of chew toys to limit the damage to your couch! It is dinnertime and you are preparing his puppy food. 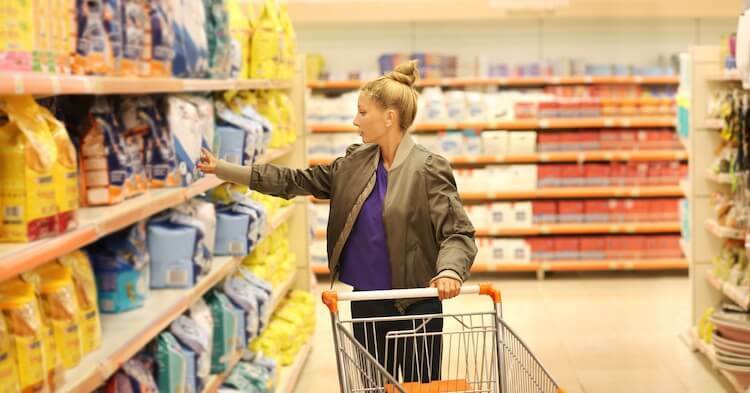 You went into the pet store, peered at the huge selection and finally decided on the bag that looked “the best” – but, is it really? Puppy diets differ from adult dogs. Choosing the best puppy food for your dog can be difficult – we’ve been there. There are certain things to look out for, certain things to avoid and as with anything, some brands are just so much better than others. Puppies have different nutritional requirements and, depending on their size, those first meals can be detrimental to their skeletal development. The best puppy food for your puppy will include whole food ingredients, real meal protein and fatty acids with natural preservatives. So, in short, look for this sort of label: Turkey, Chicken, Potatoes, Carrots and Whole Eggs. As opposed to this on the label: Ground Whole Corn, Meat and Bone Meal, Corn, Gluten Meal, Animal Fat preserved with BHS/BHT, Salt and Caramel Color. It should also state it is suitable for puppies, or growth stages, and whether it is for large breeds or not. Suitable for all puppies including large and giant breeds. Recommended for small to large breeds during puppy stage up to 1 year of age. Suitable for puppies of all sized breeds. No corn, wheat or soy. Gluten and grain free. Suitable for all sized breeds. Puppy life stage. Grain-free, gluten free, no corn, wheat or soy. Suitable for small and medium breed puppies. AAFCO growth label, suitable for all puppies including large breeds. Controlled levels of calcium to support large breed skeletal development. Growth profile under AAFCO guidelines, suitable for all puppies including large breeds. Suitable for all puppies including large breeds. In short, different puppies have different needs. There are 192 breeds recognized by the American Kennel Club and this doesn’t include all the new designer hybrids. There are giant breeds, small breeds, working dogs and companion dogs – all of this has a huge impact on what they should be eating. A puppy food should meet all their nutritional requirements; especially their protein and fat needs. This applies to puppies of all sizes. Protein are the building blocks of every cell in every body. It is crucial to cell repair, growth and function. The general guidelines state that puppies should eat at least 5.5 grams of protein per day, per pound of body weight until they reach full maturity. For small-medium puppies this could be around 12 months of age. Any quality puppy food will at least meet this requirement. Fat is also an essential part of any dog’s diet. Fat, in its dry matter should constitute at least 8% of a puppies diet and when fully matured this reduces to 5% of their diet. Fat provides energy and, as we know, puppies burn through a lot of that. Not only this, but studies have shown that certain fatty acids improve neurological function in puppies which ultimately increases their trainability. Carbohydrates, whilst not having a minimum requirement in dog feeding, are crucial when energy needs are high. Growing puppies find cooked carbohydrates extremely useful. If you have a large or giant breed, it does make your job of choosing a food a little harder. A large breed is defined as one who will reach at least 70lb in weight. A giant breed is one who will exceed 100lbs as an adult. These breeds experience a period of rapid growth between 3-6 months of age. Bones that grow too quickly are less dense making the skeleton and joints weak (this is why large breeds are more prone to orthopedic disease and bone and joint disorders). 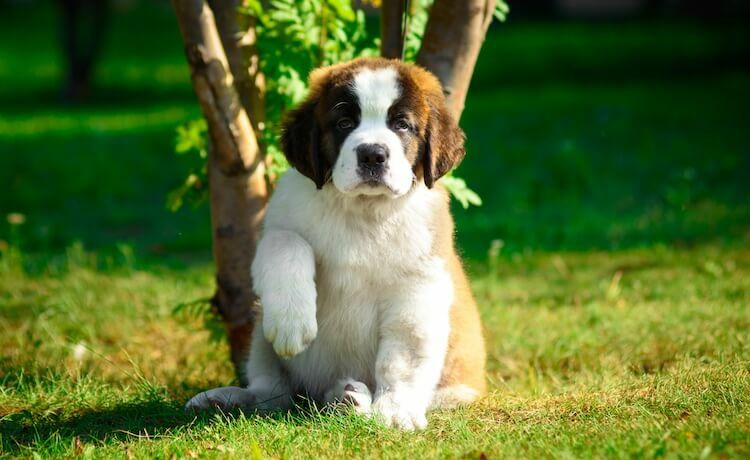 When choosing a puppy food for large or giant breed puppies, it is vital to choose a food that has undergone trials which meet the Association of American Feed Control Officials guidelines. The labelling should clearly state whether the food includes large breeds or excludes them. So, what does all this information look like on a dog food label? 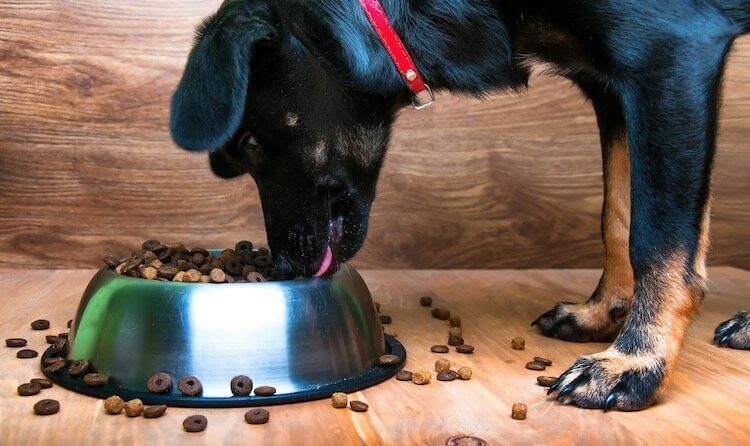 The The Association of American Feed Control Officials have guidelines for all dog food manufacturers. Whilst they are not official regulations, they are certainly a good place to start if you are looking for a high quality dog food. Always start by looking at the ingredient list, they should be listed in descending order of predominance by weight. In short, the highest quantity ingredient is at the top of the list, the lowest, at the bottom. Ideally, you want a good protein source as the first ingredient (an animal meat source). The label should also include a nutritional adequacy statement. This tells you what type of pet the product is for and what stage of life. Growth stage means puppy food, all life stages means just that. Large or giant breed labelling should also be obvious. Feeding directions should be clearly stated. This will explain how much of the food should be fed based on the weight of your puppy. When feeding a puppy, the directions will usually be based on the predicted adult weight. The ingredients found in dog food can be classed as major and minor. Major should be those easily recognized as animal or plant products. Minor ingredients will be those that supply minerals, vitamins and other ingredients. A puppy should be fed anywhere from three to four times per day. Ideally you should split a puppy’s food into 3 or 4 meals per day, reducing this to 2 meals when they are fully matured. Smaller and more frequent feeding helps to prevent over-stretching his small tummy. When introducing any new food, use the 25 to 75 rule. Mix 25% of the new food with 75% of the old food, gradually increasing the amount of new food until you are feeding only the new diet. You will likely swap your small-medium breed to an adult food when they are around 12 months of age. For large or giant breeds, this may take up to 18-24 months of age. Avoid free-feeding puppies (i.e. making feed available at all times of the day). Most puppies don’t understand the concept of self-control yet. Not only that, but over-feeding can be detrimental to their development, and their weight, especially for obesity prone dogs. Control their calories and only allow 10% of their diet to be treats. This may mean you use some low calorie and healthy treats for those training sessions. How Much Food Does A Puppy Need? For a puppy weighing 25lb at 12 weeks would be. His calorie intake will change as he grows and when he reaches full maturity. Most dog foods indicate feeding directions on their label based on the dog’s predicted adult size. It’s best advised to follow manufacturer guidelines, but, if you are unsure check with your veterinarian or breeder. Which Food Is Best for a Puppy? Canned food (i.e. wet) has a higher water content (60-87%) than dry (3-11%), but, other than that, it really does come down to how the nutritional requirements of your dog are are met and your budget. Dry puppy food is easily stored and has a good shelf life. It typically has a protein content of 18-32% with a fat content of 8-22%. Unless you use a full portion of wet food in one meal, you have the issue of storage and spoiling. However, canned food typically has higher protein content of 28-50% and a fat content of 20-32%. Raw puppy food requires a little more organization – whether you decide to feed a complete readymade food or make your own. Then there’s the added issue of remembering to take it out of the freezer to defrost in plenty of time. There has also been concern of DIY raw feeders not meeting the nutritional requirements for large breed puppies, specifically the calcium and phosphorus content. Finally, there has been the advent of dry combined with freeze-dried raw. 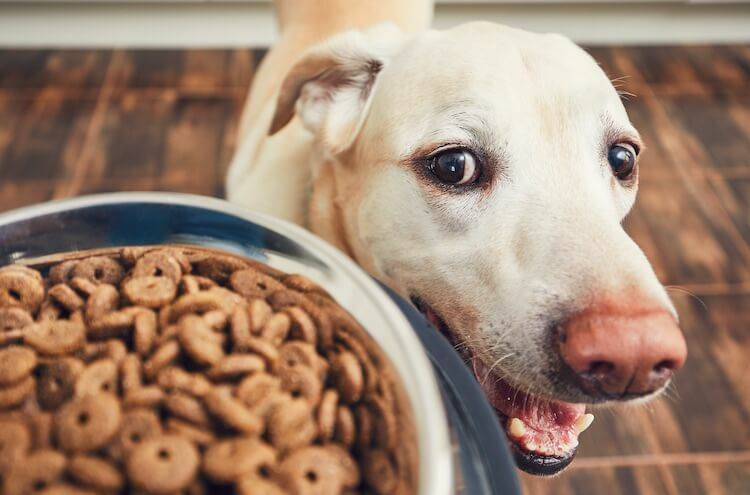 To help you on your search for the best puppy food, based on customer and independent food reviews, we have compiled the most popular dog food brands. Blue promote their foods as the number one selling natural food in the US. Ensuring they top their ingredient lists with real chicken, lamb or fish, they offer a range of products for all life stages including grain free, meat rich and veterinarian diets. Independent reviews highly recommend their products and customer reviews seem to agree. Originating in Texas, Merrick pride themselves on using high quality ingredients. Using fresh, real whole foods they refuse to use preservatives, fillers or anything artificial. They have a range of products across the life stages and have recently added freeze-dried raw bites to their menu. Again, independent reviewers and customers seem to love their products. Orijen pride themselves on being biologically appropriate. Their food features fresh whole meats, liver, tripe, cartilage and marrow in ratios which mirror a natural diet for our canine companions. They keep carbohydrate levels low as they believe they hold no place in a dog’s diet. Orijen often perform well in food comparisons by independent reviewers. This company advertise that all their products will have real meat, fish or fowl as their first ingredient. They also boast zero grains and added probiotics to help digestive health. Their proteins are often unique sources like venison, bison and wild boar. Performing well in independent reviews, customers rate them highly too. Wellness have a few ranges of food; complete health, core and simple. Their complete health boast grain free options, core focus on high protein content and simple limits ingredients for dogs with intolerances or sensitivities. They are liked for their range of products – it means you will always find a product to suit and their ingredients perform well in independent review. The best puppy food is one that meets his nutritional requirements and is appropriate for his size. Consider your budget and whether you want to feed dry, wet or raw. The general rule of thumb is to choose a food with a minimum protein content of 22% or 30% for large breeds with a fat content of at least 8% or 9% for large breeds. 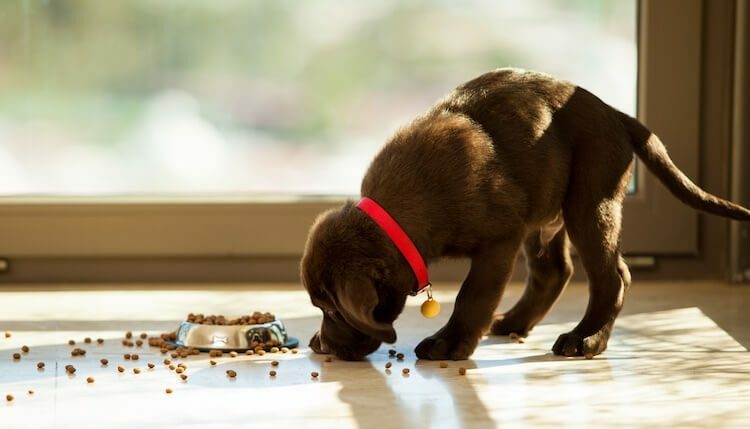 When Should You Stop Feeding Puppy Food to A Puppy? You should calculate his daily energy needs based on his size and age. This will inform how many calories he should be eating. You can use our calculator above. Most foods do include feeding directions on the label which are informed by his predicted adult size. When Do I Switch a Puppy To Adult Food? When he’s no longer a puppy. Small to medium breeds mature around 12 months of age. Large to giant breeds can take up to 18-24 month to mature. When he’s fully grown, swap him to an adult food. How Do I Transition Between Different Puppy Foods? Use the 75/25 rule. Feed 75% of the old food with 25% of the new food and gradually increase the amount of the new food compared with the old food until he’s fully transitioned. Any loose stools suggest that the transition is going too quickly. Wet Vs. Dry Food For Puppies? Wet food generally has a higher protein and fat content than dry food. It also has a higher water content. Ultimately, providing the nutritional needs of your puppy are met, choosing between wet and dry food is entirely up to you. It’s no surprise that the dog food market is a bit of a minefield. There’s so much information to get our heads around. The important thing is to understand the nutritional needs of your dog. This will vary depending on his breed, size and activity level. Which food you choose to feed is ultimately your choice, whether that’s dry, wet or raw. Always ensure the food is suitable for his life stage and is appropriate for his size. Large breed owners need to pay particular attention to the calcium content of their food. We have found the top-rated puppy foods based on independent reviews and customer ratings, but, ultimately the choice is yours. Let us know your experiences on your puppy journey in the comment section below. Is Royal Canine a good quality food for German Shepherd puppies? Like most feed manufacturers, Royal Canine have many different types (i.e. dry and wet). Make sure their food has undergone trials which meet the Association of American Feed Control Officials guidelines as a Shepherd will grow to be a large dog.